RacesAndClasses (RaC) was made to bring the best RPG experience to Minecraft servers. 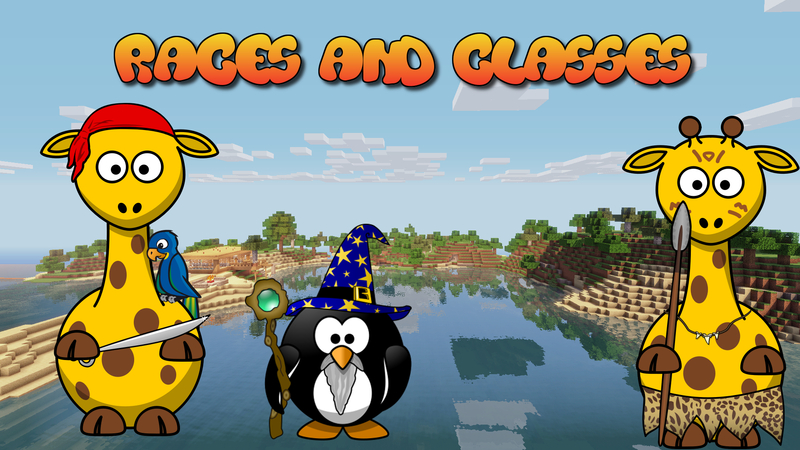 You are able to customize your own classes and races, making your server a world full of adventure! RaC is inspired by the biggest MMORPG game in the world, known as World Of Warcraft. RaC offers plenty of configuration, for each individual server. For example some server owners love the teleport arrow for raiding, and some don't; so It's all up to you. RaC is as mentioned, a customizable plugin, that also counts for custom traits. This means, that any developer can make their own traits and make his/her server even more special! post a comment on the comment section below. First of all: All these components can be disabled in the config! Checking the Version of the plugin against the newest release Version. Downloading the newest Version if enabled. Also the Plugin uses an Error Uploding Service, which connects to my Domain: www.tobiyas.tk. The Errors are visibly ONLY to me (Tobiyas) and are regularly checked to find and fix bugs faster than via Tickets. All these services are optional and can be disabled via Configuration. If you use the config.raceMaxHealth: ... of a race, this has been removed with 1.1.7. You now have to use config.healthbonus: ... (as in classes) instead. You get 20 base health + race healthbonus + class health bonus. Set this option to false and do a restart with the old Version. For best Use with 1.0.3 (RC 2)! This will convert all File DB related Data to YML data. If you do NOT do this, your PlayerData will be LOST!!! you can safely ignore this step. Only runs on Bukkit distros using Spigot API (spigot, paper, ...). First: I cannot for the life of me find any documentation on what exactly is the official Minecraft Version compatibility for this plugin. Second: Would this be updated to 1.13.2 at some point? This plugin is exaaaaaaaaaaaaaaaaaactly what I'm looking for for my RPG server. I would like to know if this plugin is being ported to 1.13, if it is great. If not that is a shame. However would you be supporting of someone else taking on the project? The plugin is wonderful and I find it to function smoother than something like Heroes. And I'd be interested in paying for a premium version if lack of monetary support is the reason for development stopping. Loving the sound of the plugin awesome layout and something i would probably invest in. But i have one question will you be bringing the plugin to 1.13? i have starting an adventure map for a YT'er Named RenDog who plays on the hermit craft server (https://dogcraft.net/). but we will be taking the world into 1.13 and i'm looking for a plugin that will do exactly what yours does that will be in 1.13. If you would like to disscus this more privatly message me on the above webiste or find me at Dogcrafts discord cannel which is also on the main page in the contents bar. UPD: some of the traits are usable in 1.13, but the most of the traits aren't. In that case i'll start using it now to get used to the config ymls. I run mcmmo. I cant get this to work. I tried mcmmo leveling, etc and i have tried the default rac system. Never changes exp and the permissions page needs more specific (default or not) and (player, admin) specification imo. Also, I think you should not ask the user to configure the leveling based on math. This should be incorporated as an on/ off option for mcmmo or otherwise, also imo. I have some questions. The first is that JumpHeightIncreaseTrait doesn't work(maybe some others too, I haven't tested them). And the second - how can I use active traits like backstab, teleport etc? Thank you in advance. Me too. I've created some races and classes, but don't understand where to put the files. Also, some files are missing, like config.yml, I can't seem to find it. Love this plugin... but I've been having troubles. I don't see why the horse trait should have any issues, yet it doesn't work. (everything else is fine for this race) Fire and lava damage resist also have problems. Will you be updating this plugin for 1.13? I have added my Mythic Mobs new mob names i.e. Skeletalwarrior= 50. This should give 50 exp for killing a skeletalwarrior but it doesn't see to work players only get 5 xp for killing a skeleton (what the mob is based on) any idea how to make this work? 2) when both my daughter and I test the server we have two different classes but the GUI skill bar for our classes get mixed up so I see her class skills (Amazon warrior, she loves Wonder Woman) and she ends up seeing mine (Dwarf Lord) this can cause problems when I use spells that she doesn't have (throw stone skill I created) many times I mess up and use different spells because I don't know which one is selected. Any idea what could be the problem? Hi, I use RAC + MythicMobs too (2.3.0). For some reason, it work fine for me, giving default minecraft experience and RAC exp at the same time. Hi, I hope someone can help. I am trying to create a class for ops to use, just the ops and no one else. What permissions should I add so the class only for Ops? but how would I make it so only ops can get it? Thanks for any help even if it just points me in the right direction. I love this plugin! so far it is the best I have found for what I want to do. Again this is by far the best plugin for classes that I have found. A suggestion I have with this plugin is to make it have a new trait? Firstly with the Vampirism Trait, what does it even do? I kind of want it so it uses your hunger to fill up it's health bar and they can fill their hunger by hitting players/mobs. Another suggestion is add a trait that makes the player Immune to fall damage and also add a trait which revolves around the full moon E.G. making a werewolf race and every full moon, this and this happens. if you could also make it so you can turn into different mobs, that would be amazing!